This corn salad recipe is a combination of the best characteristics of three recipes, which I guess makes it OUR authentic recipe. It is refreshing and a perfect complement to any barbecued or grilled entree'. We served this on "Mexican Fiesta" night along with steak and chicken fajitas. To view that recipe and instructional video, Click Here. My apologies about the quality of the above picture. I took it with my IPhone before we dug in, and I couldn't get the lighting right. 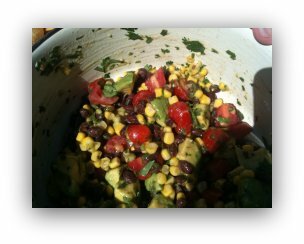 This delicious salad has sweet corn, black beans, sweet cherry tomatoes and avocado in a Mexican vinaigrette. You will LOVE IT! In fact, our son and a buddy of his ate half of it as a dip with corn chips before we could even set it on the table! Come to think of it, if you add some diced grilled chicken to this salad, it would make a great lunch. Whisk all ingredients above together until smooth and well mixed. Pour dressing over the salad and mix. Best to let sit overnight to allow flavors to fully incorporate, but it is delicious if you have to eat it immediately. To add additional flavor, grill sweet corn still on the cob and cut the corn off. Will add some nice smokiness. If you would like to ask Dave a question about this recipe, Click Here. He will respond within 24 hours, probably sooner. I send out a monthly email with some additional BBQ information that doesn't appear on the site. To receive future additions of The BBQ Gazette, simply type in your first name and email address below. And no worries, your info is safe with me. I'm the only one who sees it. BBQ My Way home page. return to side dishe recipes.